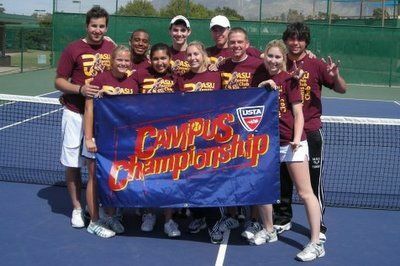 The Arizona State University club tennis team heads to New Mexico State University in Las Cruces March 7-8 for the USTA Tennis on Campus Championships – Southwest to battle against club teams from University of Arizona, University of News Mexico and New Mexico State University. This co-ed collegiate event will bring together some of the top tennis clubs in the Southwest for two days of competition, with the winner of the tournament guaranteed a berth in the national championships held April 16-18 at the Surprise Tennis & Racquet Complex in Surprise, Ariz.
Each of the universities will field multiple teams at this event, which employs the World TeamTennis style format of play. Last season, the <?xml:namespace prefix = st1 ns = "urn:schemas-microsoft-com:office:smarttags" />Central Arizona team from ASU finished second behind UNM. For more information on Tennis on Campus, or to help get your program started visit www.tennisoncampus.com. You may also contact USTA Southwest Community Tennis Manager Michelle Moyer at mmoyer@southwest.usta.com.